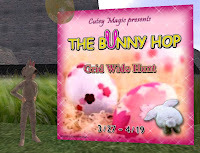 Easter is almost here, and, as usual in sl, there are Easter Egg Hunts beginning! A friend mentioned on to me, and I have been following the links to see the places and find the eggs. This one is called the Bunny Hop (that might explain the people you see hopping around sl..... I do say MIGHT! heheheh), and covers a lot of different places, there being apparently over 160 different eggs to find. The Bunny Hop HQ, aduchi momoyama (146, 189, 40) is where it all starts, with a notice and an example egg. Follow the directions the rabbits are taking the eggs, and you will soon find your first real egg, with a gift and the landmark to the next location. It's not a quick race, some of the eggs are REALLY difficult to find (yes, I did follow the yells of "It's over here!" a couple of times...), others are in plain view. Take time to look round places and enjoy the exploration, it's well worth it. As in most such hunts, the eggs are placed by stores to get you to see their stuff, and there are some nice things out there! 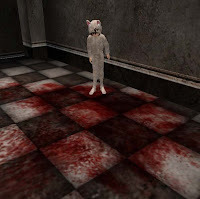 It's the different locations that are really fun though, the colourful, the strange, the downright weird (like the place covered in blood, and where i stood in something icky..... rather cool really...) and the truely beautiful like the place in the sky with transparent floors. I've put some pictures in to let you see. So far I have found seven eggs, the next is proving difficult to find... but there are still loads for me to discover, and I am going to have fun doing so.... anyone want to join me? Sweet bunny costume! Did you buy it there, or is it found elsewhere? hehhehe thanks Talon, that one is all my own work, though from the Bunny Hop I now have several bunny outfits... one of them rather pink! They are part of the freebees in the eggs, which is nice.